My apologies up front if this comes across as part blog-post, part infomercial. 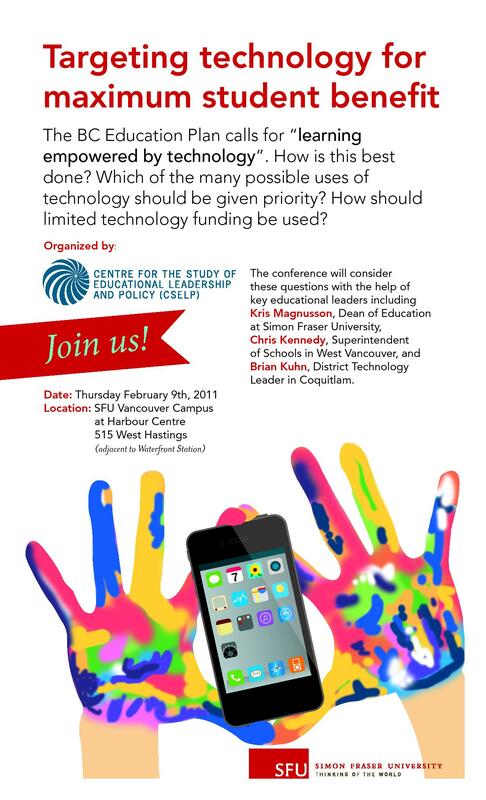 I am really looking forward to being part of the upcoming symposium: Targeting Technology for Maximum Student Benefit, to be presented by the Centre for the Study of Educational Leadership and Policy at Simon Fraser University. While much has been bandied about around technology relating to the BC Education Plan, we’ve only just touched the surface. So far, much of the conversation and views expressed have taken quite a simplistic approach; the conversation has fractured on the one side to notions of embracing personal devices as forward steps to a privatized or American-style public education system, and on the other of charging ahead noting that increased digitization of schooling is inevitable. Imagine that you have a budget to support the educational use of technology in a school district that has previously constructed all the necessary technical infrastructure, but has not yet introduced a plan for the use of technology to support learning. Your budget is one-third of what you would require to do all that you feel would be effective given the rate at which staff and students can learn to effectively employ technology. Provide a way of thinking about the broad array of potential uses of technology in education, including a conceptual overview of the options that you believe have been shown to be most important for improving student outcomes through ‘personalizing’ their learning in ways suggested by the BC Education Plan. Describe how you would use the resources at your disposal over a 5-year period to initiate technology use in a way that would maximize both immediate and eventual benefit for students in a sustainable and generative fashion. Include a rationale for what you choose to do, and to defer. It is an interesting and challenging scenario, and I am committed to pushing out some thinking, as well as to sharing some thoughts on the future (or perhaps, the lack thereof) of online learning, and a road-map embracing personally owned devices while ensuring equity, and how, using Michael’s Fullan’s words “We ensure we have the right drivers for this change”. And, personally, as much as I think there is a list of things we could or should do, I also believe there is a list of things we need to stop doing, or not start doing, to keep our focus clear and on student learning as our goal. We need to commit our focus on Grades 4 – 10, to focus on a space for learning that allows for personalization, to have expectations for leadership from our administrators and librarians, to have our learning leaders become our digital learning leaders and integrate, integrate, integrate with the arts, as well as throughout the curriculum. On the flip side, we need to take a critical look at the future of distributive learning, to not allow technology to solely report to the business side of our organizations, to be cautious and not go slate (iPad) crazy, and to be wary of digital ‘drill and kill’ or the ‘shiny new thing’ syndrome and, to not get stuck in the endless loop of technology strategy planning sessions. Following our responses and participant discussion, Kris Magnusson, SFU Dean of Education, will also have a chance to share his thinking on the above scenario, which will then lead into panel discussions. I understand from Bruce Beairsto, who has organized the event, there are about 170 people who have signed-up including teachers, administrators, parents, trustees and other educators, leaving only space for about 10 more registrations. You can find out more about the event from Bruce (here) or register directly (here). Of course, you can also participate online via Twitter at #bcedsfu. The simple idea of learning empowered by technology is not so simple. The more opportunities we have to engage, challenge, press on, pushback, and move forward to some common thinking, the better it is for our system. I have registered for that day and am looking forward to being part of the conversation. These are exciting times here in BC and I hope this symposium takes the conversations in directions that will challenge our thinking about technology and its use in education. I also hope that the conversations will provide us with a better sense of what the BC Ed Plan may look like in the months to come. Thanks Sue – it is great that we can take aspects of the Ed Plan and go into some detail on what it can look like. We have spent lots of time making the case for change, and now have a sense of the big ideas, but we need to look at what it can mean for schools and districts. Hi Ellie. It is a really interesting scenario t consider. Hopefully people will join in to the conversation – nothing to register for. This is very promising symposium. I have met with district professionals, principals and teachers and all of them told me that there is a problem with tech equipment in BC public elementary schools. I am sure that teachers and principals will be happy to see bigger budgets for technology. The question is if the budget shift will occur. Thank you for information, I will try to register to the symposium. Whizz gadgets, gizmos, discussions and competitions! Personalized online math tutor for 5 to 13 year olds through schools and homes. Chris, I wish I could be there. I think this discussion could be one that starts many more. One of the biggest concerns about the BCed Plan is the “details” and how are we going to pay for it. While the discussion is hypothetical, it could be a springboard to move the conversation forward. Good luck! I notice that this event is now SOLD OUT as of January 23; obviously this is very timely topic and there is a great deal of interest around the province. I would like to have our local tech directions group participate. What other options are there for districts to participate in the discussion? Can the session be broadcast on the web?